My eight year old niece Chloe, had worn out her favourite shoes - her toes were almost popping out the front of them! She is a typical girly girl and loves everything pink and glittery. Well, just as they were headed for the dustbin I saved them!! I couldn't see all that lovely sparkly pink material go to waste now could I (I suppose I'm a bit of girly 'girl' myself. In next to no time at all another little ballerina doll was born. Her tights are from the lining of the shoes, and her bodice the outer fabric - it looks lovely and shimmering in the light! The ballerina's shoes are two of the gemstones from the original shoes too. I wonder if Chloe will recognise the fabrics when I give her the doll this weekend? The above ATC is my entry for the current theme on MAMMA. The current theme is 'The Jumble Sale' and is detailed here by Nancy who is currently looking after the group and came up with the great, challenging theme. The background to my ATC is created by layering random pieces of masking tape then painting over the top with a few different colours of acrylic, then wiping off part of it before dry. This is a technique described by Claudine Hellmuth in one of her wonderful books. The fabric part of my ATC is actually a piece of the inner lining from Chloe's old shoes (it was underneath the pink satiny fabric). It was a fine mesh (as Hardy once said to Laurel!!) and ideal for applying an image transfer onto (with Golden's Regular Gel (Matte) medium. The other required elements - triangle are the lace, and metal, the key. Following on from yesterday's post here's a couple more photos of my latest dolls. The close up of the face is one where I used watercolour pencils to outline the eyes - following the step by step guide below - and no smudges!!! This month's theme over on the Yahoo group Fantastic Flat Paperdolls is 'Ballet' and I made this pretty ballerina for my swap partner. Hope she'll like it! This ATC I made is for a Yahoo group I'm in (New Inspirations) and is for this month's lottery. I had to choose this month's theme as I was lucky enough to win last month's lottery ATCs (vintage children). I picked 'Musicals - past or present' as the theme and I decided to base my ATC around 'My Fair Lady' with the luvverly Eliza doolittle - one of my favourite musical films. The background is torn pieces of musical score, then layers of gesso and inks. I like the grungy look of this in contrast to the clean cut image of Eliza - which I thought was quite fitting to the story of the film! The current theme on the MAMMA group over on Flick is to make ATCs with a distressed background using Gesso and inks as described by Trish Bayley in her great tutorial. The theme was 'Friends' but of course I overlooked that and was merrily making some ATCs using this technique using some rubber stamps with vintage adverts on them - doh! I made a couple more with a friendship theme too! My efforts are shown above. 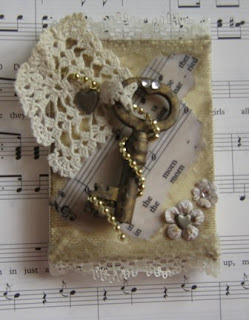 This month's challenge over on Flickr's GAS MAMMA (group for altered art swaps)is to alter a key with romance as a theme. Not being the most imaginative of people I couldn't think of how to effectively alter a key - a key's a key right! In the end I decided to make a little piece of artwork - with the key as the focal point - and used a mini canvas measuring just 2 1/2" x 3". I love the shape of the old key I used and it was very rusty to begin with so I just enhanced it a little with some metallic gold rub on and added two silver heart shaped gems at the top. I entwined some gold beading around it and through some lace too which is attached to the canvas by a heart shape brad. The canvas itself I painted with acrylic, coloured the edges with more of the gold metallic rub on - coated the whole thing with beeswax and adhered some music score with more of the wax (it's an extract from 'Get me to the church on time' from My Fair Lady) A bit of lace top and bottom and a couple of flowers to finish. Seeing as I was at a loss as to what to do for this challenge, I'm really pleased with the end result. Wanda (who is known as needlewings over on Flickr)is giving away some gorgeous goodies over on her blog 'A Frayed of Fibers' to celebrate her 100th posting. You need to go to her blog, leave her a comment and you'll be in the draw! While you're there, take a look at some of her beautiful creations - not to mention some cute ducks too!